Starbucks is eliminating full price! 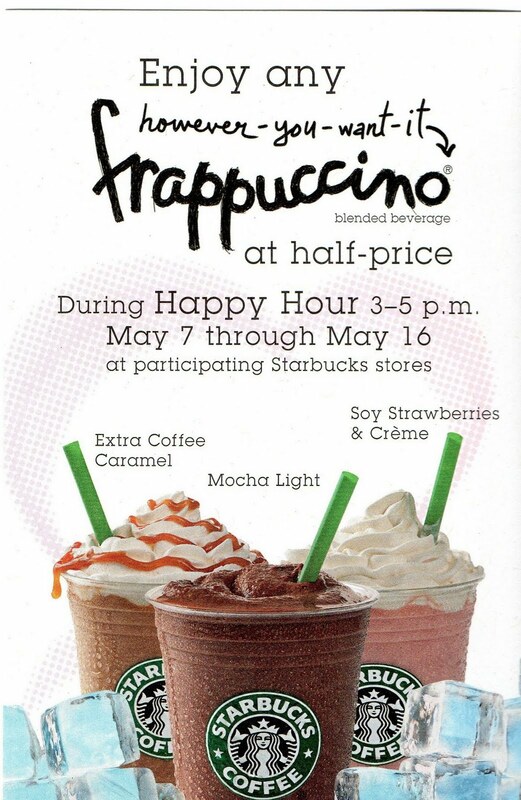 From May 7th to May 16th, Starbucks is having a "Happy Hour" promotion. 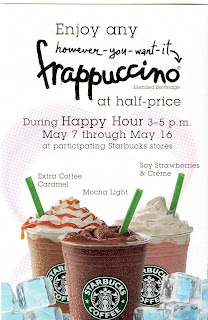 Just stop by a participating Starbucks store between 3pm to 5pm and the frappuccinos will be 50% off! Today I bought 2 Grande Caramel Frappuccinos and 1 Cafe Vanilla Frappuccino for $5.71 at my local Starbucks! The Grande frappuccinos I got cost $3.95 each so this was a great savings for me. This 50% off promo is a great opportunity to try different frappuccino flavors. I usually get a Caramel or Coffee Frappuccino but I wanted to try out the new Cafe Vanilla Frappuccino. I think it's delicious. It's a nice blend of vanilla and coffee. What's your favorite frappuccino at Starbucks? Leave a comment and let me know!